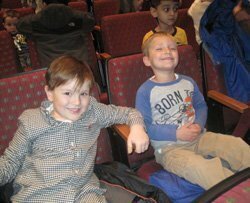 On November 15, two of our classes, MWF Room 204 and 5 Day had the opportunity to go on a field trip to Raritan Valley Community College and enjoy the music of Tom Chapin and Michael Mark in “Give Peas a Chance”. One of the highlights of the trip was just getting there on the school bus! 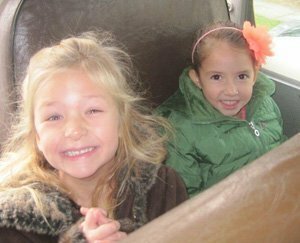 For some of the kids this was their first time on a school bus, so they learned about seat belt safety and some school bus rules before leaving for the show. They were very excited and loved how bouncy the bus was. The show was a interactive listening and singing concert based on food and other things that grow. Not only was there singing but many instruments were used and introduced to the children, such as a guitar, Bass, Concertina (squeeze box), Banjo, Grand Piano, Autoharp, and an Irish whistle. Kids were able to participate by singing along, clapping, and even learned a song in sign language. The show was enjoyed by all!